State the modern atomic theory. Learn how atoms are constructed. The smallest piece of an element that maintains the identity of that element is called an atom. Individual atoms are extremely small. It would take about fifty million atoms in a row to make a line that is 1 cm long. The period at the end of a printed sentence has several million atoms in it. Atoms are so small that it is difficult to believe that all matter is made from atoms—but it is. Atoms of the same element are the same; atoms of different elements are different. Atoms combine in whole-number ratios to form compounds. These concepts form the basis of chemistry. Although the word atom comes from a Greek word that means “indivisible,” we understand now that atoms themselves are composed of smaller parts called subatomic particles. The first part to be discovered was the electron, a tiny subatomic particle with a negative charge. It is often represented as e−, with the right superscript showing the negative charge. Later, two larger particles were discovered. The proton is a more massive (but still tiny) subatomic particle with a positive charge, represented as p+. The neutron is a subatomic particle with about the same mass as a proton but no charge. It is represented as either n or n0. We now know that all atoms of all elements are composed of electrons, protons, and (with one exception) neutrons. Table 3.1 “Properties of the Three Subatomic Particles” summarizes the properties of these three subatomic particles. 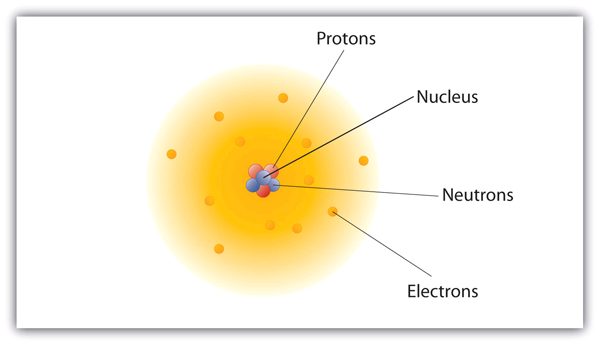 Atoms have protons and neutrons in the center, making the nucleus, while the electrons orbit the nucleus. The modern atomic theory states that atoms of one element are the same, while atoms of different elements are different. What makes atoms of different elements different? The fundamental characteristic that all atoms of the same element share is the number of protons. All atoms of hydrogen have one and only one proton in the nucleus; all atoms of iron have 26 protons in the nucleus. This number of protons is so important to the identity of an atom that it is called the atomic number of the element. Thus, hydrogen has an atomic number of 1, while iron has an atomic number of 26. Each element has its own characteristic atomic number. Atoms of the same element can have different numbers of neutrons, however. Atoms of the same element (i.e., atoms with the same number of protons) with different numbers of neutrons are called isotopes. Most naturally occurring elements exist as isotopes. For example, most hydrogen atoms have a single proton in their nucleus. However, a small number (about one in a million) of hydrogen atoms have a proton and a neutron in their nuclei. This particular isotope of hydrogen is called deuterium. A very rare form of hydrogen has one proton and two neutrons in the nucleus; this isotope of hydrogen is called tritium. The sum of the number of protons and neutrons in the nucleus is called the mass number of the isotope. Neutral atoms have the same number of electrons as they have protons, so their overall charge is zero. However, as we shall see later, this will not always be the case. The most common carbon atoms have six protons and six neutrons in their nuclei. What are the atomic number and the mass number of these carbon atoms? An isotope of uranium has an atomic number of 92 and a mass number of 235. What are the number of protons and neutrons in the nucleus of this atom? If a carbon atom has six protons in its nucleus, its atomic number is 6. If it also has six neutrons in the nucleus, then the mass number is 6 + 6, or 12. If the atomic number of uranium is 92, then that is the number of protons in the nucleus. Because the mass number is 235, then the number of neutrons in the nucleus is 235 − 92, or 143. The number of protons in the nucleus of a tin atom is 50, while the number of neutrons in the nucleus is 68. What are the atomic number and the mass number of this isotope? When referring to an atom, we simply use the element’s name: the term sodium refers to the element as well as an atom of sodium. But it can be unwieldy to use the name of elements all the time. Instead, chemistry defines a symbol for each element. The atomic symbol is a one- or two-letter abbreviation of the name of the element. By convention, the first letter of an element’s symbol is always capitalized, while the second letter (if present) is lowercase. Thus, the symbol for hydrogen is H, the symbol for sodium is Na, and the symbol for nickel is Ni. Most symbols come from the English name of the element, although some symbols come from an element’s Latin name. (The symbol for sodium, Na, comes from its Latin name, natrium.) Table 3.2 “Names and Symbols of Common Elements” lists some common elements and their symbols. You should memorize the symbols in Table 3.2 “Names and Symbols of Common Elements”, as this is how we will be representing elements throughout chemistry. 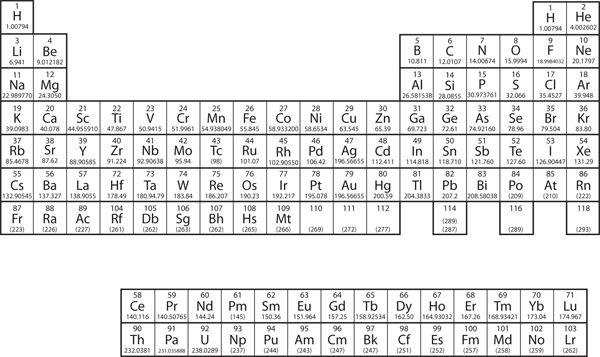 The elements are grouped together in a special chart called the periodic table. A simple periodic table is shown in Figure 3.2 “A Simple Periodic Table”, while a more extensive one is presented in Chapter 17 “Appendix: Periodic Table of the Elements”. The elements on the periodic table are listed in order of ascending atomic number. The periodic table has a special shape that will become important to us when we consider the organization of electrons in atoms (see Chapter 8 “Electronic Structure”). One immediate use of the periodic table helps us identify metals and nonmetals. Nonmetals are in the upper right corner of the periodic table, on one side of the heavy line splitting the right-hand part of the chart. All other elements are metals. where C is the symbol for the element, 6 represents the atomic number, and 12 represents the mass number. What is the symbol for an isotope of uranium that has an atomic number of 92 and a mass number of 235? How many protons and neutrons are in 26F? The symbol for this isotope is 92U. This iron atom has 26 protons and 56 − 26 = 30 neutrons. How many protons are in 11N? It is also common to state the mass number after the name of an element to indicate a particular isotope. Carbon-12 represents an isotope of carbon with 6 protons and 6 neutrons, while uranium-238 is an isotope of uranium that has 146 neutrons. Chemistry is based on the modern atomic theory, which states that all matter is composed of atoms. Atoms themselves are composed of protons, neutrons, and electrons. Each element has its own atomic number, which is equal to the number of protons in its nucleus. Isotopes of an element contain different numbers of neutrons. Elements are represented by an atomic symbol. The periodic table is a chart that organizes all the elements. List the three statements that make up the modern atomic theory. Explain how atoms are composed. Which is larger, a proton or an electron? Which is larger, a neutron or an electron? What are the charges for each of the three subatomic particles? Sketch a diagram of a boron atom, which has five protons and six neutrons in its nucleus. Sketch a diagram of a helium atom, which has two protons and two neutrons in its nucleus. Define atomic number. What is the atomic number for a boron atom? What is the atomic number of helium? Define isotope and give an example. What is the difference between deuterium and tritium? 14. Which pair represents isotopes? 15. 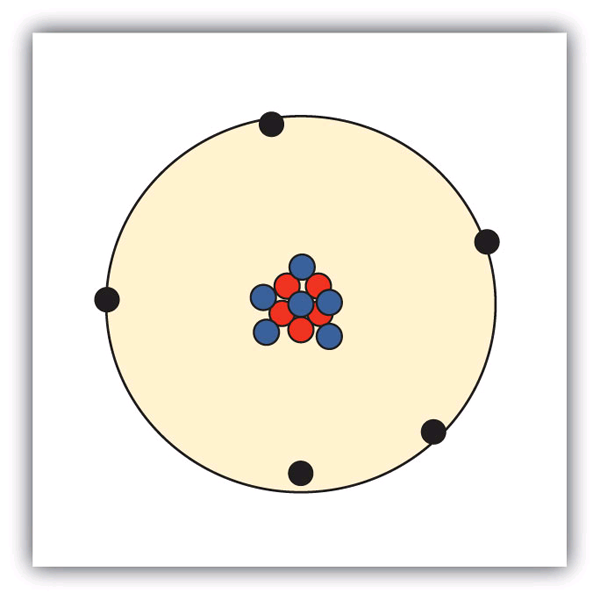 Give complete symbols of each atom, including the atomic number and the mass number. 16. Give complete symbols of each atom, including the atomic number and the mass number. 17. Americium-241 is an isotope used in smoke detectors. What is the complete symbol for this isotope? 18. Carbon-14 is an isotope used to perform radioactive dating tests on previously living material. What is the complete symbol for this isotope? 19. Give atomic symbols for each element. 20. Give atomic symbols for each element. 21. Give the name of the element. 22. Give the name of the element. All matter is composed of atoms; atoms of the same element are the same, and atoms of different elements are different; atoms combine in whole-number ratios to form compounds. A proton is larger than an electron. The atomic number is the number of protons in a nucleus. Boron has an atomic number of five. Isotopes are atoms of the same element but with different numbers of neutrons. are examples. Atomic Theory by Jessie A. Key is licensed under a Creative Commons Attribution-NonCommercial-ShareAlike 4.0 International License, except where otherwise noted.